Home » Health » What Is Thalassemia? Thalassemia is a disease of blood disorders caused by genetic factors and causes the proteins present in red blood cells ( hemoglobin ) doesn't function normally. The iron obtained by the body from food is used by the bone marrow to produce hemoglobin. Hemoglobin contained in red blood cells serves to deliver oxygen from the lungs to all members of the body. Thalassemia patients have low hemoglobin levels, therefore oxygen levels in the body of thalassemia sufferers are also lower. There are two types of thalassemia that occur, namely alpha and beta, where these two types have a gene link that determines the severity of this inherited disease. Thalassemia beta is a more common type. Thalassemia can sometimes interfere with the activities of the patient due to the weak oxygen levels in the body. Some things that can be experienced by the patient is tired, easily drowsy, unconscious, to difficulty breathing. In addition, untreated thalassemia can also lead to complications such as heart failure, stunted growth, organ damage, liver disorders, and death. The symptoms of thalassemia experienced by each person vary, depending on the severity and type of thalassemia suffered. To work normally, hemoglobin requires 2 alpha proteins and 2 beta proteins. Abnormalities in alpha proteins are called alpha thalassemia, and abnormalities in beta proteins are called beta thalassemia. If there are many mutations in the genetic material that makes hemoglobin, then the thalassemia suffered will be severe. However, if the mutations that occur little or limited, then the symptoms can be lighter. For severe cases, blood transfusions will often be needed. Some examples of thalassemia symptoms are low weight, shortness of breath, fatigue, and jaundice. Mutations in DNA that produce oxygen-carrying hemoglobin throughout the body are the cause of a person suffering from thalassemia. Not yet known exactly why such mutations can occur. Blood tests can be performed to diagnose thalassemia. But to know the type of thalassemia suffered, the patient must do a DNA test. Blood tests can be used to evaluate hemoglobin and measure the amount of iron contained in the blood. In addition, this method can also be done to analyze DNA to determine whether a person has a mutated hemoglobin gene. Examination of infants performed during pregnancy (antenatal examination) is useful to provide information that parents need to prepare themselves. In addition, early examination also aims to determine the presence of other genetic diseases (eg sickle cell anemia). Thalassemia may be treated with cord blood transfusion and bone marrow transplantation. However, these two methods of treatment are not suitable for all thalassemia sufferers and may result in a number of complications. Regular blood transfusion is necessary for beta thalassemia patients, but this can result in the accumulation of iron in the body and cause serious health problems. Treatment to get rid of excess iron in the body can be done with chelation therapy. The risk of thalassemia complications can be reduced by routine medical examinations. Some possible complications of thalassemia that can occur are hepatitis, osteoporosis, late puberty, and heart rhythm disorders. The skin and parts of the white eye become yellow (jaundice / jaundice). The stomach becomes swollen (caused by enlarged spleen or liver). Deficiency of red blood cells or anemia (causing the breath to feel tight, the body easily tired, and lethargic). Newborns have different hemoglobin with normal hemoglobin, fetal hemoglobin. Normal hemoglobin replaces fetal hemoglobin after six months of age. That is why most babies born with thalassemia will develop symptoms after they are six months of age or older. Lack of hemoglobin in children with severe thalassemia will make the body produce more bone marrow than usual. This is the way the body seeks to overcome the shortage of hemoglobin. This can lead to unnatural bone growth or bone skeletal deformities. Body growth at puberty will be delayed or not occur at all due to disruption of the hormone system in the body. Mutations in the DNA that produce oxygen-carrying hemoglobin throughout the body are the cause of a person suffering from thalassemia. It is not known exactly what caused the mutation to occur. However, this is thought to be related to genetic factors. Cases of genetic diseases (such as thalassemia and sickle cell anemia) are more common in Asian, African-American or Middle Eastern countries, as well as some countries such as Cyprus, Italy, or Greece. The portion of the hemoglobin affected by the mutation and the number of inherited mutations from the elderly determine the type of thalassemia suffered. Mutations can affect hemoglobin consisting of 2 alpha proteins and 2 beta proteins. Thalassemia suffered will be more severe if the genes that have mutations more and more. Symptoms of thalassemia do not appear if a mutated gene, but the person can reduce the disease to his child because he is a host or carrier of thalassemia disease. Symptoms of thalassemia appear only mild if two genes mutate, and this condition is called thalassemia alfa minor. Symptoms of thalassemia appear to be moderate to severe if three genes mutate. This condition is also called hemoglobin H disease. The fetus will die or the newborn will die shortly after birth if the four genes mutate. This condition is called thalassemia alfa major. Symptoms of thalassemia that appear only mild if only one gene that mutated, and called thalassemia beta minor. Symptoms of thalassemia appear to be moderate to severe if two genes mutate, and are called thalassemia beta major or Cooley anemia. Two mutated genes can also be called thalassemia beta intermedia if symptoms are milder. Usually babies who experience this condition look healthy at birth. But after the age of two, new symptoms will appear. Low levels of red blood cells. The shape and size of red blood cells are diverse. Red blood cells are smaller than normal. Blood tests can also be used to evaluate hemoglobin and measure the amount of iron contained in the blood. In addition, blood tests can also be applied to analyze DNA to check the type of thalassemia suffered. Examination conducted during pregnancy or called antenatal examination is useful to provide information that parents need to prepare themselves, as well as to detect the presence of other genetic diseases (eg sickle cell anemia). An antenatal examination consists of two methods. The first method is a cell examination of a sample of amniotic fluid that is usually performed when the womb is 15-20 weeks old, or called amniocentesis . The second method is cell examination of placental samples or chorionic villus sampling , and is usually performed when the womb is 11-14 weeks old. There is one method that can be done by couples who want to have offspring, but have a tendency to pass on genetic diseases to the baby. The method is called the preimplantation genetic diagnosis, which removes the egg from the female ovary and fertilizes it with male sperm in the laboratory. The examination is performed on a fertilized embryo to ensure the absence of thalassemia, then a healthy embryo can be implanted into a woman's uterus. The type and severity of thalassemia will determine which treatments can be performed. Usually thalassemia minor patients experience only mild symptoms and do not require special care, but blood transfusions are usually needed to help overcome thalassemia complications, after childbirth, or after surgery. Most thalassemia beta intermedia patients do not require blood transfusions. While patients with major thalassemia beta generally require regular blood transfusions (usually once a month or less) to get the hemoglobin needed by the body. Frequency will be determined according to the condition of thalassemia experienced by the patient. Treatment to overcome the excess iron in the blood can be done with chelation therapy. It aims to prevent extensive organ damage (eg to the liver, body hormone glands, or heart) due to accumulation of iron in the blood. Usually children who have received a blood transfusion about 10 times require chelation therapy. The frequency of chelation therapy will be assessed regularly and may change, but usually this treatment lasts a lifetime. There are currently three chelation agents or drugs used in chelation therapy, namely deferiprone, deferasirox, and desferrioxamine. Tests to measure iron levels can be done with blood tests, liver organ biopsy, echocryography, electrocardiogram and MRI scans . To monitor whether chelation therapy is effective, checking levels of iron in the blood is done routinely. Treatment to cure thalassemia is possible with bone marrow transplantation. Bone marrow donated from a proven and healthy donor is used to replace bone marrow affected by thalassemia and is useful for producing healthy blood cells. Children under the age of 16 have a greater chance of survival and survival because organ damage has not been so severe. In addition, children who receive bone marrow donors from siblings who have the same type of gene network also have a greater chance of success in bone marrow transplantation. It is very difficult to find a suitable bone marrow type from a person who has no blood relationship with the patient. If he does not have the risk factors mentioned above, then the chances of success are 90 percent and the chance of survival is 95 percent. If he has fewer than three risk factors, then the chances of success are more than 80 percent and the chances of survival are over 85 percent. If he has three risk factors, then the chances of success are more than 55 percent and the probability of survival is less than 80 percent. 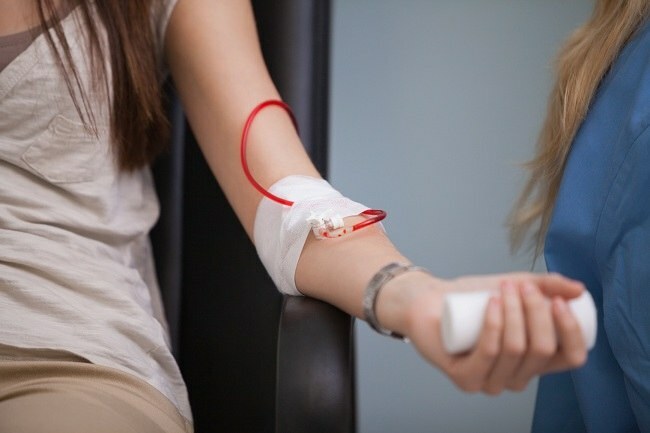 In addition to the above methods of treatment, there are also a number of treatments that can be done to relieve thalassemia disease in order not to aggravate the condition of the patient, such as hormone treatment for children with slow puberty or patients with thyroid gland problems, vaccinations and antibiotics to treat infections, treatment for osteoporosis, to gallstone surgery. Patients with thalassemia beta major and some patients with thalassemia beta intermedia at risk of complications. Below will be explained one by one about the complications associated with thalassemia. Heart damage due to high levels of iron can lead to decreased cardiac pump strength, heart failure, arrhythmia (irregular heartbeat), and accumulation of fluid in the heart tissue. There are two types of routine examinations that should be undertaken by patients with thalassemia beta major, namely the examination of heart function every 6 months and a thorough examination by using electrocardiogram once every 1 year to measure the conduction of heart electrical flow. Both of these tests are performed by a cardiologist. Treatment to improve cardiac function can be done with more thorough chelation therapy and consumption of angiotensin converting enzyme inhibitors. Bisphosphonates can be consumed to maintain bone density and reduce the risk of fractures, but this drug can affect normal bone growth. Therefore bisphosphonates are not recommended for children and adolescents. Splenic enlargement occurs because the organ is difficult to recycle blood cells that have abnormal forms. This results in an increase in the amount of blood present in the spleen, thus making the size larger. Blood transfusion aimed at increasing the number of healthy blood cells would be ineffective if the spleen had enlarged. The spleen will become overactive and begin to destroy healthy blood cells. Splenectomy or surgical removal of the spleen is the only way to overcome this problem. Vaccinations to treat the potential for serious infections, such as flu and meningitis, should be done if your child has had surgical removal of the spleen. Immediately see a doctor if your child has symptoms of infection, such as muscle aches and fever, because it can be fatal. Damage to the liver due to high iron levels can lead to several problems, such as hepatitis, fibrosis or liver enlargement, as well as cirrhosis (chronic degenerative disease in which normal liver cells become damaged and replaced by scar tissue). Therefore, patients with thalassemia are recommended to perform liver function tests every three months. Prevention of liver infection can be done by taking antiviral drugs, while the prevention of liver damage is more severe can be done with chelation therapy. The hormone system is regulated by the highly sensitive pituitary gland of iron. Thalassemia major beta patients, despite chelation therapy, may experience hormonal system disorders. Height and height examination should be followed by children with thalassemia every six months for the growth rate to be known. Meanwhile, the growth check on teenagers who have entered puberty should be undertaken once a year. 0 Response to "What Is Thalassemia?"